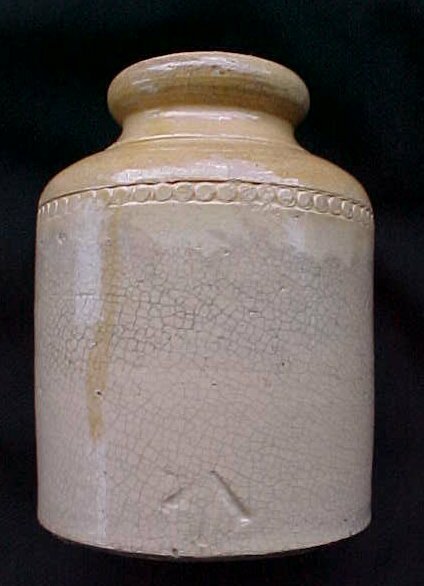 Stoneware bottles appear to be much less common than the glass. 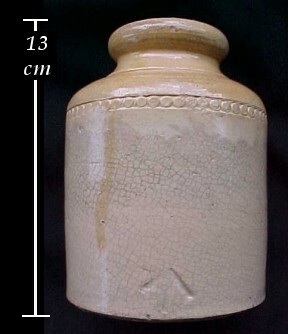 This jar is 13 cm in height and was found in Guangzhou China by Richard Somerville who kindly provided the photo. 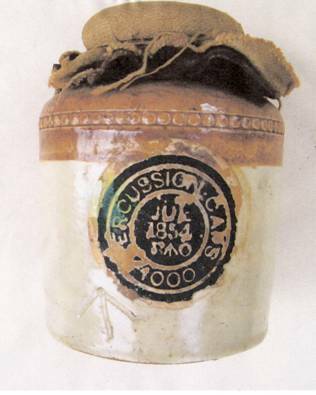 This jar was found by recreational divers in Esquimalt Harbour during the 1970's. 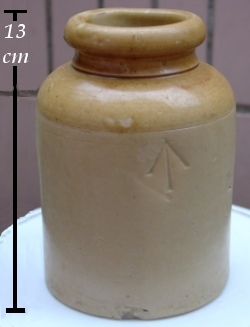 Like the jar above, it is also 13 cm in height, and 9.9 cm diameter. 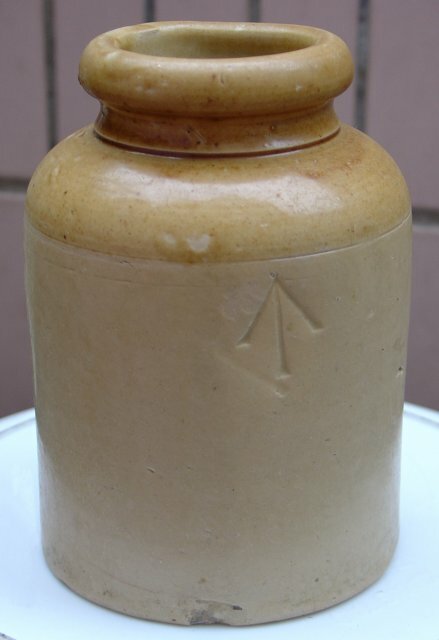 This jar also has a decorative band and an arrow near the bottom. Stone Jar for Sea Service Caps. 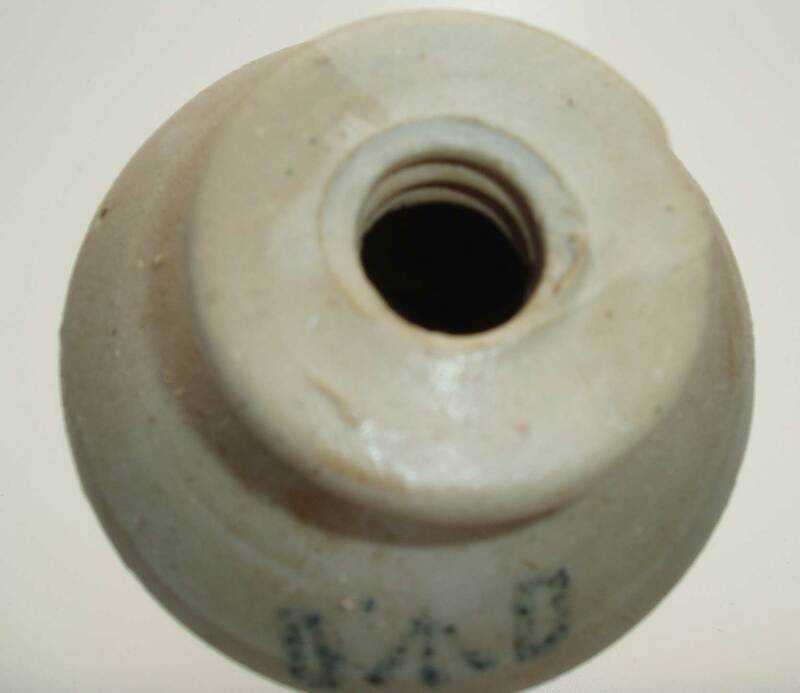 Labelled “PERCUSSION CAPS 1000” it is dated July 1854 and bears the broad arrow government mark impressed into the jar and printed on the label. 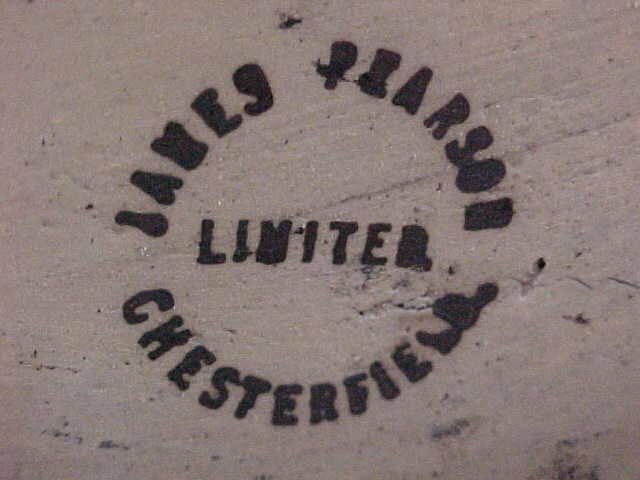 Its owner notes that there is no potter’s mark on the base. 133mm high x 95mm base diameter. Holden, G.C. in “Notes on Laboratory Course Sections B,C,D. 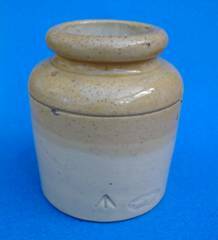 1865” writes that these jars were closed up with an India rubber covering. This example has a protective canvas cover over a dark leather like substance, which is almost certainly India rubber. 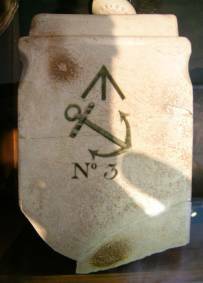 Stone Jar bearing the broad arrow government mark and found in Chatham Dockyard, once a Royal Navy facility. 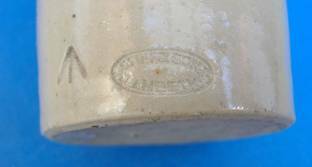 Its potter’s mark “STIFF & SONS LAMBETH” dates it to post 1863. 70mm high x 56mm base diameter. It has the capacity to hold 180 loose percussion caps. 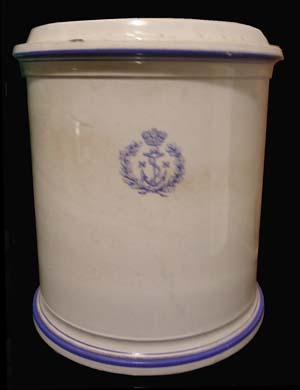 It is very tempting to speculate that the Royal Navy used jars such as this to hold a smaller supply of caps, however until further evidence comes to light is exact use must remain a mystery. This jar was found in Australia. The photo is courtesy of Greg Brace. 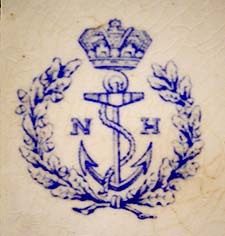 The Department of Defense in Australia was initiated in 1901. 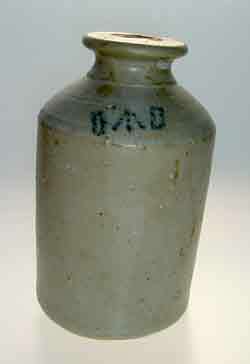 This bottle appears similar to mercury bottles used in the gold fields and may have contained mercury. The bottle probably dates to between 1901 and the 1920's. 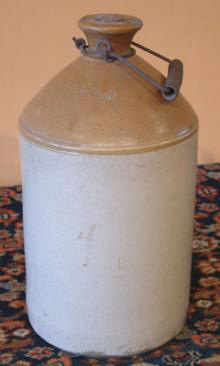 The bottle is 150 mm (6") high and 85 mm (3.5") across. It has a thread inside the lip to take a screw stopper. 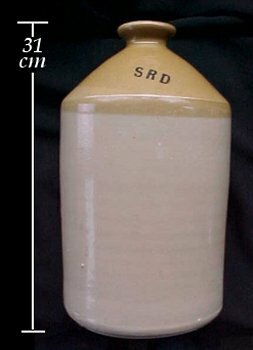 The bottle has a definite slope as shown in the photo. 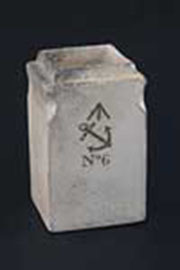 Pottery shard of a square jar recovered during construction at Naden Naval Base in Esquimalt. The naval seal on this container includes a King’s (or Queen’s) Broad Arrow above an anchor. 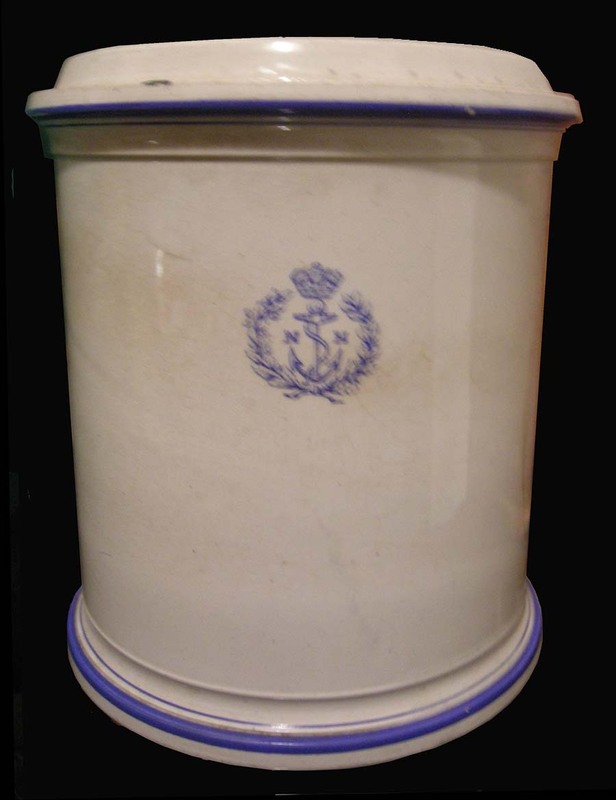 Naval hospital jar with what appears to be Queen Victoria’s crown and was almost certainly used at Esquimalt. There was likely a lid which is now missing. There is considerable debate as to just what the "SRD" stands for. In the "Dictionary of Military Abbreviations: British - Empire - Commonwealth" by B.K.C. Scott, "SRD" is listed as "Service Rum Diluted". See additional information below. These crocks date from WWI and were probably in use until the beginning of WWII. 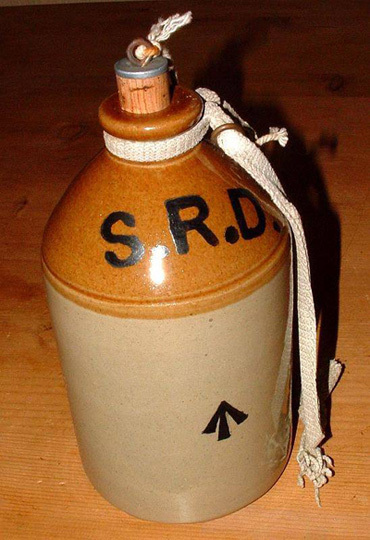 Unofficially, the "SRD" also stood for "Soon Runs Dry" and "Seldom Reaches Destination". I find it interesting there was no arrow or government markings on these bottles until the photo below was found. To this day they are still a fairly common find in areas along the western front, from WWI. 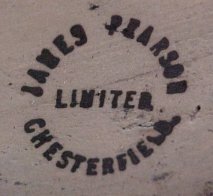 mark on base "James Pearson" Chesterfield. This company exited from the 19th century to 1939. Considerable controversy still exists for the meaning of "SDR", but it would appear "Supply Reserve Depot" is the most likely meaning as listed by Library and Archives Canada. 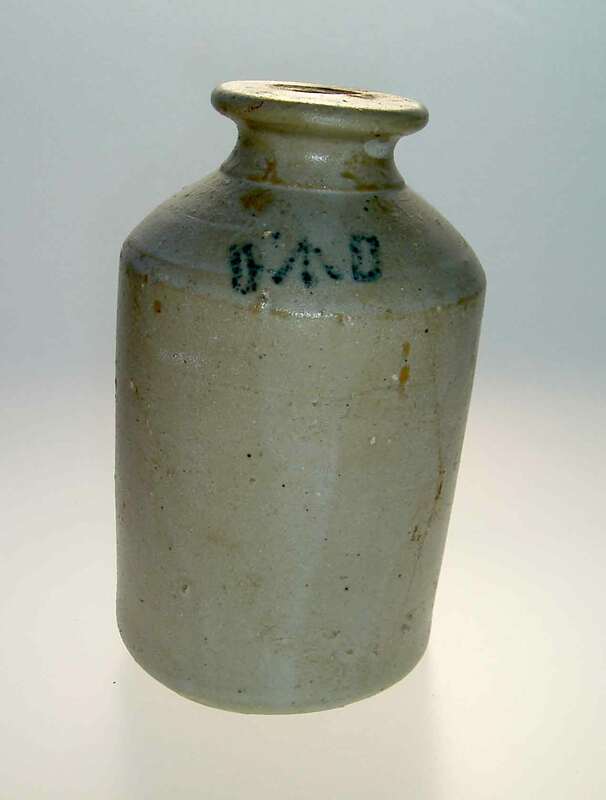 This photo is from the Arthur Museum http://www.blitzandpeaces.co.uk/Museum/main.asp and provides an example showing these pottery bottles were occasionally also marked with a large broad arrow. This is the only example I have seen to date. As for the contents, I suspect they were likely used for more than just rum and may have contained anything required for the war effort. Archaeological finds of these jugs in WW1 sites could provide some remaining contents for analysis to confirm what they were used for. 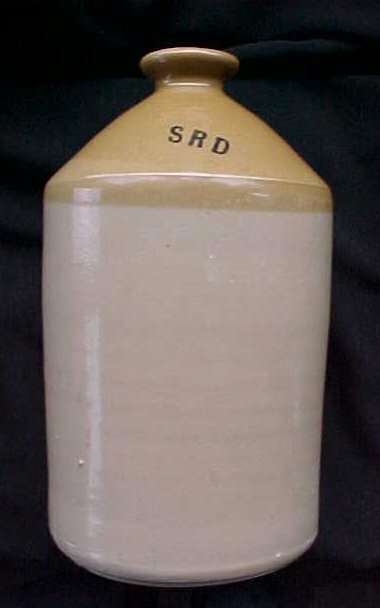 The initials SRD should also be found on other more perishable items such as crates or on wax seals. The SRD controversy shows that despite the volumes written on WW1, archaeologists can still shed light on the more mundane day to day life in the trenches. This is a less common variety with the "SRD" impressed. The handle appears to be original and would have aided in bringing these jugs to the front lines. Photo courtesy of Kilshaw's auction house in Victoria, B.C. 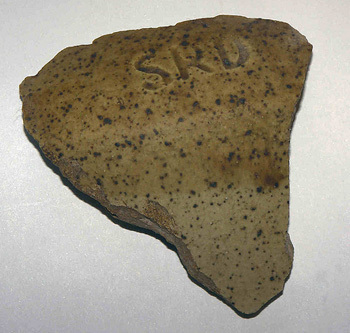 "A small fragment of a British Rum Jar found in a field under the Passchendaele Ridge in Flanders. Small but luckily the piece with SRD (Supply Reserve Depot) on it!" 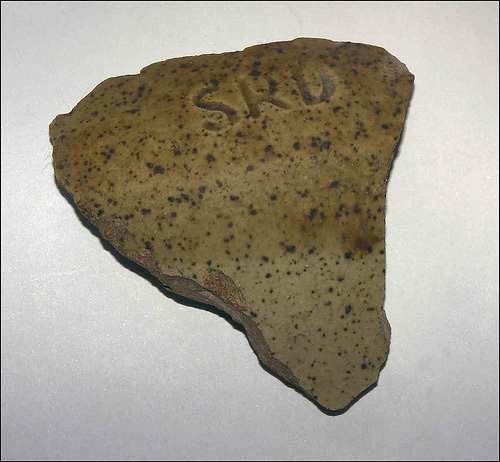 This fragment appears to have a crude salt glaze finish with an impressed SRD. It would be interesting to have a photo of a whole example.